Today, building vehicles is more complex than ever. The reasons are manifold: on one hand the enormous increase in customer demand for quality, design and comfort, on the other, the search for innovative materials, new manufacturing technologies and more efficient processes for manufacturers and suppliers. Good to know that high-end adhesive solutions make an important contribution and increasingly represent an alternative to screws and clips. Thanks to their enormous flexibility, adhesive bonds adapt perfectly to a wide variation of designs to ensure reliable fixing. In addition, adhesive tapes fulfil many practical supplementary features. Thus vehicles are becoming lighter, virtually vibration-free, and quieter. No wonder that today, an automobile contains on average about 4.5 m² of tape. 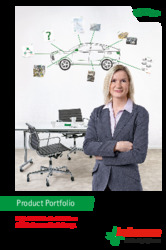 What our customers value about Lohmann: With each new adhesive solution, we have the whole process in mind. Which specific requirements are placed on the tape? Is a roll required, an efficient spool or a high-precision die-cut? On which substrates should be bonded? How can we find a particularly efficient solution for automation? These are just some of the questions whose answers are important to us from the outset. We focus on one single goal: to find the perfect adhesive solution for your application. Convince yourself of our know-how and get to know a partner who achieves more for you. One of the biggest challenges to the automotive industry is the joining of different materials and surfaces. We face this challenge and accompany you throughout your whole process. Beginning with the requirement analysis via the development and formulation to the finished die-cut part. We ensure the highest quality and efficiency and are always on the cutting edge. Our portfolio covers the bonding of emblems and lettering, kick plates and roof trims, exterior mirrors, decorative parts and trim parts. In this connection, we also offer solutions for various clear coat systems. It rattles, rumbles, squeaks, creaks, rattles? We have countless sound-reducing materials with which we can precisely outfit your surface self-adhesively. Whether as a roll, coil, sheet, or die-cut part, we can always offer you a customized solution. Example: Combination of expanded polypropylene (EPP) and adhesive tape. For new developments the requirements for adhesive joints are constantly growing. Additionally, a lot of new, innovative materials are used which can't be bonded any longer with mechanical solutions like rivets or screws without destroying the structural integrity of the materials. New surfaces which are dirt-repellent or self-curing are really challenging for adhesives. The reactive adhesive tapes DuploTEC® SBF from Lohmann combine the performance of structural bonding with the ease in handling of a pressure-sensitive adhesive tape. DuploTEC® SBF are easy to handle, dimensionally accurate, can be applied in advance and can therefore be processed quickly and cleanly. The automotive sector is one of the leading industries worldwide. Mega-trends (for example, autonomous driving and electric mobility) are, together with factors such as climate change, security and globalization, todays challenges. The electronics in the vehicle thus play a key role in the meantime and must continually become even more compact and lighter in view of the ever-increasing demands on performance and reliability - and this is exactly where the adhesive solutions from Lohmann come into play! Adhesive solutions from Lohmann are tailor-made - whether coils, rolls or die-cuts. Everything is focused on one goal: the perfect adhesive solution for your application! Example: Bonding of displays, design or functional elements.